Justin’s note: You may remember my essay from August where I explained how I made 46% in three weeks by doing nothing. My secret? Currencies. I was in Turkey at the time and the lira was plummeting against the U.S. dollar. I enjoyed the Mediterranean sunshine while the purchasing power of my dollars increased 46%. “Why is your father sleeping in the hallway?” I asked. The young Burmese man looked slightly uncomfortable. 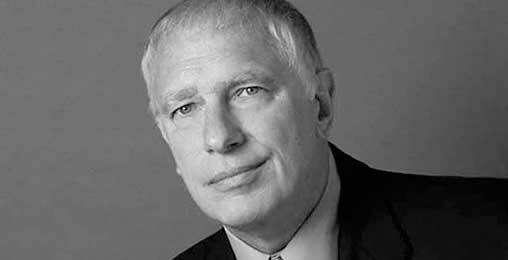 I looked from his downcast face back to his elderly father, stretched out on a bed and mattress that almost completely blocked the second-floor hallway of their home. The young man was my business partner on several mining ventures in the Southeast Asian nation of Myanmar. We’d come to his family house in a rural area of the country’s north for a dinner and visit. The father’s apparent residence in the hallway was perplexing. 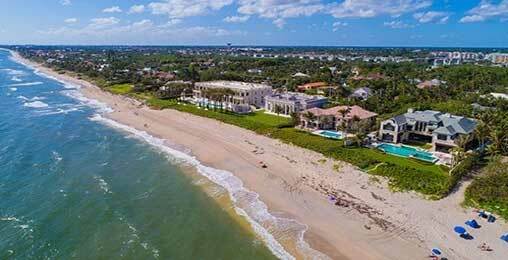 The home was huge—scanning the second floor, I could see at least five doorways. There was apparently no lack of rooms. So why was the old man forced into this awkward position? He even had a small chest of drawers and a shaving mirror set up in the hallway. Finally, our young host gave in. “Let me show you something,” he said, gesturing toward one of the nearby doors. We gathered around as he opened the door, revealing a wall of paper. Stacks and stacks of Burmese kyat (pronounced “chat”)—with the wads of bills reaching toward the ceiling and taking up the entire room. Our host closed the door. He then moved to the next room—opening the door to reveal another mountain of cash. And another, then another. Currency had filled all of the upstairs rooms, displacing his father to the hall. Part of the issue was the small currency denominations in Myanmar. At the time, the largest bill in circulation was the 5,000 kyat note—worth about $3 at prevailing exchange rates. Myanmar is a generally poor country. But it has a sizeable upper class that made millions or even billions of dollars from timber, jade mining, and other basic industries. At $3 per bill, you can imagine how much space it would take to store a million dollars in cash. And storing cash was common—as many wealthy Burmese simply didn’t trust the banks or were trying to hide their money from authorities. Similar situations have played out in other nations. Pablo Escobar was said to hold so much cash—stashed around various locations in Colombia—that billions of dollars were eaten by rats. Nearby in Venezuela, a parallel situation is unfolding. 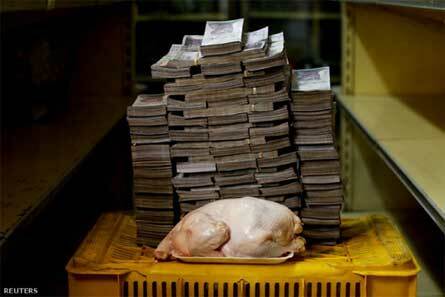 Today, the price of a chicken in the country is reportedly running at nearly 15 million bolívars. Below is an internet meme recently circulating that sums things up. The issue in Venezuela is runaway currency depreciation. Like Germany’s Weimar Republic in the early 1920s or Zimbabwe in 2008, the government has lost control of its currency—and the value has plummeted against other currencies like the dollar. That’s led to mind-boggling local prices for simple goods. For reference, today, 15 million Venezuelan bolívars is worth about $50. Venezuela is an extreme case. But as I’ll show you in today’s essay, a rout in wider emerging market currencies has been on for several months now—and it’s setting up a major opportunity for resource investors in the right places on Earth. Emerging market currencies are getting crushed. The Argentine peso is down 87% against the dollar since the beginning of 2013, with the decline recently accelerating. The Russian ruble, Brazilian real, and South African rand are also plummeting—down 54%, 45%, and 40%, respectively, during the same time frame. Even the Canadian and Australian dollars have both dropped nearly 23% against the dollar. Investor flight from emerging markets and their currencies has been hastened by the Trump trade war. Many global investors simply don’t know which country might be hit next by tariffs—so they’re steering clear of the lot until the dust settles. All of this has some critical implications for commodities. Most investors follow the US dollar prices of hard assets like gold and copper. Right now, gold is down 35% from its 2011 peak of $1,900 per ounce, and copper is 40% off its highs of $4.50 per pound. But just look at those commodities priced in some of the world’s other currencies. 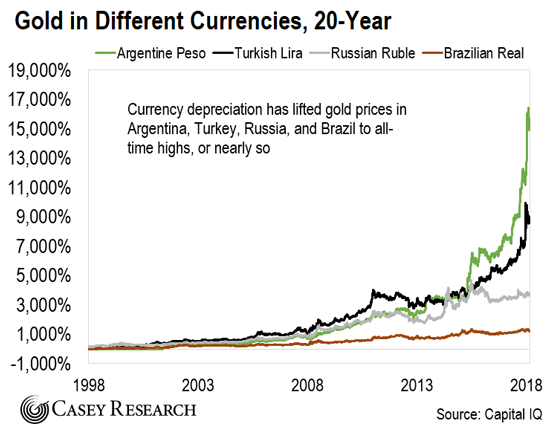 With emerging market currencies falling against the dollar, domestic gold prices in Argentina and Turkey are at all-time highs. Other nations like Russia and Brazil are not far off their historical peaks. It’s the same story in copper. 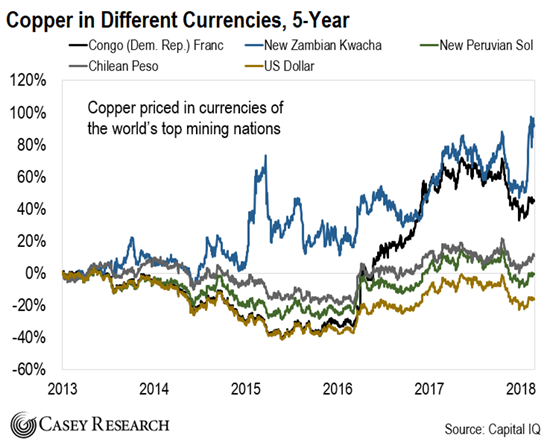 The chart below shows how currency depreciation in key copper-producing nations like DR Congo, Zambia, and Chile has lifted local prices to new records, or at least multi-year highs. Of course, few investors follow the Zambia kwacha-denominated price of copper or the going Turkish lira rate for gold. But mining companies that operate in these countries are acutely aware of such metrics—because currency fluctuations have actually been responsible for some of the biggest earnings surprises in the mining industry during recent years. And our analysis shows we could be on the cusp of another round of “stealth profits” from the recent plunge in global currencies. During the last big rout in global currencies, some shocking developments happened for mining companies. If you look closely at the charts above, you’ll see that many currencies in big mining nations took a major hit in 2013 and 2014. And that prompted some equally big news for miners. 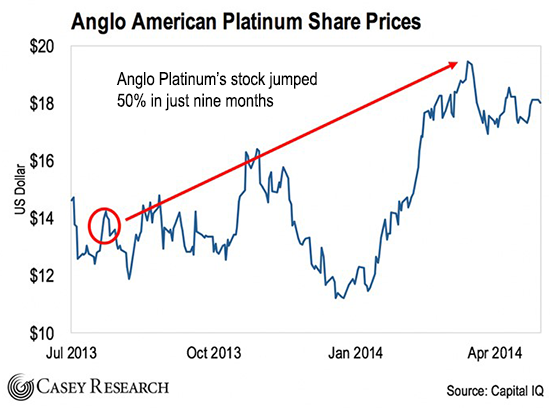 In July 2013, for example, South African platinum major Anglo American Platinum did something no one expected. It posted a major rise in profits. The company’s headline earnings for the first half of 2013 jumped by 88%, to 5.14 rand—up from 2.73 rand in the first half of 2012. The news caught investors by surprise. During the period, platinum prices had actually been falling. Not only that, but labor rates in South Africa had been rising. All factors seemed to point to lower profits for a company like Anglo. But there was one single factor investors weren’t counting on: currencies. During the first half of 2013, the rand had plunged 14% against the dollar. In fact, Anglo’s financials cited this currency drop as the biggest factor in raising the company’s profits. This currency-driven 88% increase in Anglo’s profits supercharged the company’s share price. Following the July 2013 earnings announcement, Anglo’s stock gained 50% in just nine months. It might seem improbable that currencies alone could cause such outsized gains. But let’s look at a theoretical example of how mining margins can enjoy huge gains when local currencies dive. Let’s say I mine gold in Brazil. I pay the majority of my mining expenses in local Brazilian real—and those production costs amount to 3,125 real per ounce of gold produced (a fairly normal number for average operations here). A year ago, the real was trading at an exchange rate of 0.32 against the dollar. So, my 3,125 real production cost translated to about $1,000 per ounce. If I was selling my gold at $1,200 per ounce, I would enjoy a profit of $200 per ounce. Fast-forward to today. Over the past year, the real has plunged by 25% against the dollar—currently trading at an exchange rate of 0.24. My local mining costs of 3,125 real per ounce stay the same. But at today’s exchange rates, my operating costs are only $750 per ounce in dollar terms. So, if I’m selling at $1,200 per ounce, my margin now jumps to $450 per ounce. That’s a 125% increase in profits. No changes to operations, no rise in the gold price—simply a shift in currency values. Although most investors don’t pay attention to such details, you can easily see the effects of currencies in the real world if you’re looking closely. In the chart below, for example, my team and I plotted operating costs for the world’s five largest gold mining companies: Barrick Gold, Newmont, AngloGold, Kinross, and Goldcorp. These five majors own mines in a variety of countries globally. Places like Canada, Australia, Brazil, Russia, and South Africa—nations where local currency values have been falling in recent months. To show the effect of currencies on operating costs, I compiled a currency index—showing the value of currencies in the world’s most important mining nations against the US dollar. You can see how that currency index (blue line) fell more than 30% between 2013 and 2015. 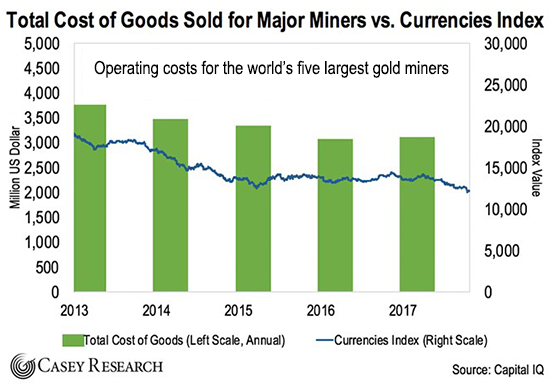 That drop in currencies corresponded with a notable drop in operating costs (green bars) for the major gold miners—all told, operating costs dropped nearly 20% by 2016. You can also see in the chart above that my mining currency index is now falling again. In fact, currencies in major mining nations are now at their lowest level of the last five years, even lower than the trough of the big decline in 2015. With global currencies taking a major hit in 2018, this is the perfect time to position for surprise, stealth profits from miners—as local operating expenses shrink in dollar-denominated terms. Justin’s note: As David said, now is the time to buy quality miners to capitalize on the recent plunge in global currencies. David has over a dozen names set to take off from this trend—and you can access his entire portfolio with a subscription to International Speculator. And to learn about another huge story that David just uncovered, make sure to check out his new video presentation. In short, President Trump just quietly signed what may go down in the history books as his most significant executive order. It’s opening up an opportunity to bring incredible wealth to you and your family—but only if you get in at the ground floor stage we’re at now. Click here to get all the details. Are you starting to invest in gold or copper miners today? Let us know if you’re scooping up shares in preparation for a commodities boom—or if you plan on staying on the sidelines—right here.